It would be one disaster that will take the world and Africa in particular years to overcome if Libya is allowed to slip into another civil war. The once enviable oil-rich country became a failed state due to the policy miscalculations in the process leading to the NATO-led overthrow of former President Muammar Gadhafi in 2011. The consequence was the civil war fought in 2014. The battle for the capital city, Tripoli, between the forces of the United Nations-backed Government of National Accord (GNA) and the Gen. Khalifa Haftar-led Libyan National Army (LNA) last week was a clear signal of the danger ahead, if the on-going peace process is drawn out. Though it had the colouration of a battle for territorial control, underneath was the factor of personality conflict and show of supremacy by Haftar and Prime Minister Fayez al-Sarraj, who heads the GNA. But more importantly, the battle has challenged the United Nations and the countries involved in finding a lasting solution to the conflict, to expedite action on the full implementation of the peace agreement. Libya must not be allowed to go the way of Syria. The Syrian crisis escalated to an uncontrollable level because of the dillydally that characterised the peace process as well as the dirty politics played by Russia and its allies on the one hand and Europe and its allies on the other hand. Syrians became victims of a vicious international group of actors who had vested interest in the country’s wealth. The Syrian crisis re-ignited Cold War era diplomacy between Russia and the West. While unarmed civilians were dying from the guns of the warring factions, Russia and the West were crisscrossing the country in a show of supremacy. Today, the fighting has wrecked Syria. The same scenario seems to be playing out in Libya. Its strategic location makes it an albatross on the neck of Africa. The once oil-rich country has become a lawless country and the bastion of international arms smuggling, human trafficking, drug trafficking, slavery, with blacks being the major victims, centre for training terrorists and home to Al-Qaeda and the Islamic State. There are no fewer than 30 armed groups in Libya, all seeking relevance through the gun. The country has been so fractionalised that it is hard to truly determine the exact number of militia groups. Some of the armed groups have formed an alliance with the GNA, others are working with the LNA and yet there are groups operating independently. Some of the armed groups are ethnic, while others are sponsored by powerful individuals and foreign interests. The conflict of interests and mutual suspicion among the armed groups has made it difficult to arrive at a consensus on issues during peace talks. This explains why the peace process is facing numerous challenges and delay in implementation. Haftar, a former ally of Gadhafi who turned renegade, had always found excuses for not cooperating with al-Sarraj even after the recent meetings held in Paris at the instance of the French president, Emmanuel Macron. The warlord reportedly rebuffed “international calls, including from the Security Council and the United States, to halt the surprise offensive launched” last week. Apparently, in his bid to justify his decision to march on Tripoli, Haftar accused the GNA of “allying itself with Islamist militias.” But the fact remains that he strongly believes he has more influence in the country than any other person, including al-Sarraj. He has no trust in the GNA led by Sarraj. In his imagination, he should be the defacto leader of post-Gadhafi Libya. The UN and others think otherwise but recognise his importance to the success of any peace move. 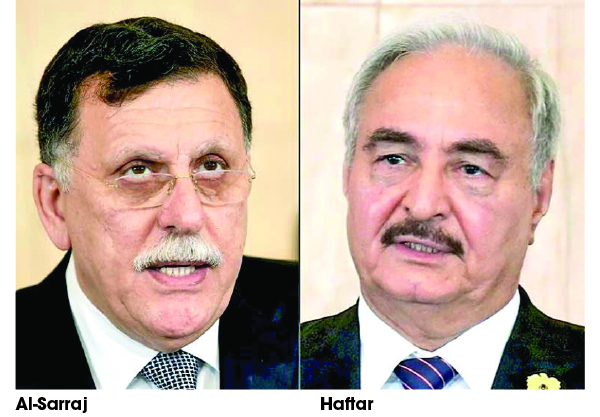 Analysts have argued that Haftar chose to attack Tripoli on a day the United Nations Secretary General Antonio Guterres was visiting the city, to demonstrate his prowess and importance. The UN boss was in Tripoli to boost a peace summit that was to hold in the city. But Haftar may have misfired by deciding to attack Tripoli as the GNA successfully repelled his forces. According to reports, no fewer than 14 of his troops were killed and 120 of his fighters taken prisoners. Even then, Haftar is not yet done as he remains the head of the rival government based in the eastern city of Tobruk. Watchers of Libyan affairs familiar with the internal workings of LNA have reportedly said “Haftar and some of his supporters feel that hardline revolutionaries and Islamists have sidelined and antagonised experienced politicians and military leaders because of their roles in the Libyan state”during the Gadhafi era. Whatever be the arguments for Haftar’s stubbornness and refusal to allow the UN-backed government to function, it is obvious that he is emboldened by the massive support he has been receiving from Egypt, Russia, Saudi Arabia and the United Arab Emirates. Certainly, the UN is in a sticky situation. Though it is backing the GNA and it is also working hard to save Libya from total collapse, its efforts are being tacitly frustrated by foreign interests who doublespeak and change camps easily. Curiously, the West has severally given support to Haftar and his allies. Even France that backs the GNA has been accused of giving covert and overt support to Haftar. That is because the West sees him as a man committed to fighting terrorists and, therefore, could protect interests in parts of Africa, where terrorists are on the rampage. Rather than openly scold Haftar, they have chosen to be silent. This is even after it had been reported that Haftar has ties with terrorists groups like the Madkhalists, a branch of the Salafists. He also has Sudanese and Chadians in his army, according reports. Therefore, some watchers of post-Gadhafi Libya have dismissed Haftar’s claims that he is fighting Islamists. But why would the West not give full support to the UN-backed government of unity? Why does the West vacillate at a time when all hands should be on deck to halt the conflict and save Libya? France represents the face of the hypocrisy of the West in tackling the Libyan crisis. While Paris approves the UN-backed GNA, and it is publicly calling for a resolution of the conflict and has even summoned two international summits to discuss the way forward, it continues its romance with Haftar in a manner that only encourages the LNA leader to be unyielding to the voice of wisdom. Following last week’s air strikes that closed Tripoli International Airport, Libya’s former colonial master, Italy, lampooned France for its continued support for Haftar. Italy was particularly irked by reports that France had objected to a European Union call on Haftar not to launch attacks on Tripoli. Italy also supports the UN-backed government, which is based in Tripoli. GNA is the internationally-recognised government in Libya. Though France had always denied Italy’s allegations, Rome’s outburst exposes the perfidy of the West in its relations with Africa. For the West, Africa is its footstool. Put differently, the West would do everything to ensure its continued exploitation of the continent. The West fuelled the crisis in Libya when it instigated the bloody overthrow of Gadhafi without due consideration to the consequences of the action on the future of the country. Eight years after the fall of Gadhafi, the country has remained on its knees, unable to rise. The best known practice in peace negotiation is for the negotiator to remain neutral. This is not the case in the Libyan conflict. The interest of the ordinary Libyan in the street is for peace to return to the country. In one of the peace summit’s held in Paris, 20 countries were represented. It was an encouraging outing. Interestingly, some of the countries have ulterior motives. They are more particular on how they will benefit from the peace deal and this explains reasons for the doublespeak trailing the talks. Libya is one of African countries endowed with rich natural resources. Besides its oil reserves, natural gas and gypsum, it has huge iron ore deposits. It also exports wheat, packaged medicaments, sheep and goats. It occupies a strategic location between Africa, the Arab world and Europe. Libyan warlords must sink their differences in the overall interest of the country and allow peace to return to the country. They owe their children and the future generation the obligation of making the country habitable at all times. It is only an environment of peace and unity that can enable the country to regain its lost glory as a leading African country. The warring factions must allow the win-win spirit to prevail.